Four Dark Days in November 11★ 24★ 63 n ON LIVE NATIONAL TELEVISION, as Oswald is being escorted from the We l l e s l e y We s t o n M a g a z i n e | w i n t e r 2 0 1 3 / 2 0 1 4 police station to the county jail, a man in a fedora steps out of the crowd and shoots him at point-blank range. The assailant is strip-club owner, Jack Ruby, an ardent Kennedy admirer. Two hours later, Oswald is pronounced dead, also at Parkland Memorial Hospital. 66 ^^ He taught himself to read before he started school. But the withdrawn, bookish kid never quite fit in. He only discovered his passion when he opened a volume by Karl Marx. "Das Kapital is what I had been looking for," he later said. "It was like a very religious man opening the Bible for the first time." And so, in 1959, Lee Harvey Oswald made his way to the Soviet Union, where he renounced his American citizenship. He joined a rifle club and became an expert marksman. But the defector soon become disenchanted with the strictures of Communist life and returned to the USA with a Russian wife and daughter. After a series of failed jobs in four cities, Oswald secured one at a book depository in Dallas. It was just the platform he needed to carry out the most heinous crime of the century on American soil. But his notoriety was short-lived. 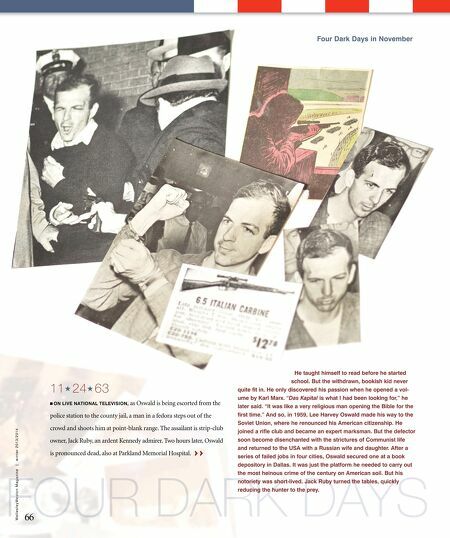 Jack Ruby turned the tables, quickly reducing the hunter to the prey.